If you've fallen behind in updating your inventory, or have just been playing around to see what CellarTracker is all about, it's easy to clear out your cellar to start from a clean slate. Tread carefully. There is no way to undo this. These steps will remove all current in-stock and pending bottles, but will preserve your consumption history. Click My Cellar at the upper right of the page in our FULL DESKTOP WEBSITE. (Our mobile site does not have these same bulk tools, but it shares all the same data with the desktop site.) We recommend changing the number of rows shown per page to the maximum allowed. Just above the first wine is a checkbox at the left edge. 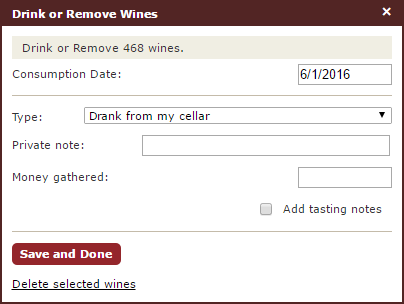 Click it to select that entire page of wines and activate the bulk editing toolbar. Click the Drink or Remove button on the bulk actions bar and then choose All Bottles At Once. 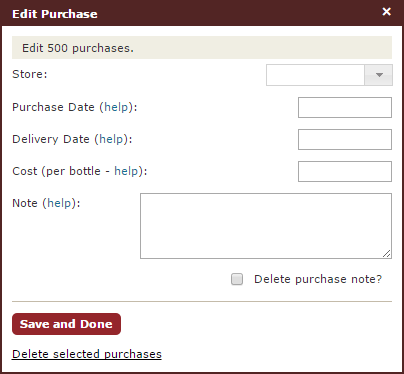 Then click on Delete selected wines at the bottom of the dialog. If wines still remain, repeat steps 2-4 until all wines have been removed. These steps will remove all of your purchase data, which includes in-stock, pending, and consumed bottles. This will wipe out your consumption history as well. Click My Cellar at the upper right of the page. We recommend changing the number of rows shown per page to the maximum allowed. 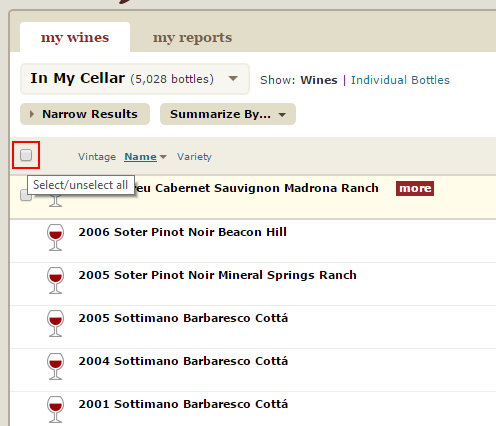 Hover over the In My Cellar dropdown and change it to Purchased. Just above the first wine is a checkbox at the left edge. Click it to select that entire page of purchases and activate the bulk editing toolbar. Click the Edit Purchase button on the bulk actions bar. Then click on Delete selected purchases at the bottom of the dialog. If purchases still remain, repeat steps 3-5 until all purchases have been removed.